When he was in his 20s, Lane Kagay worked as a bike messenger in Chicago, his home town. In the mid-90s, after he had moved to Mariposa, California, friends in LA invited him to bicycle down the coast for a visit. "It was October and I had no tent," he says. "It was a life-changing event, nerve-wracking but liberating." Afterwards, he devoted himself to cycling and again became a messenger, first in LA, later on in San Francisco. "Bike messengers get paid based on time or on the size and weight of the packages they deliver," says Kagay, who designed and welded together a sturdy front rack that enabled him to carry an 80-pound load. Other messengers took note, and by 2005 he had built a website, quit the messenger job, and was making five or six racks a day. Sales have snowballed since he and his wife Karen moved to Eugene in April of 2007. He also formed a joint venture with welder Michael Gould to add a European-style cargo bike, capable of carrying a couple of kids or a keg of beer, to his product list. "We sold the first one a year ago," he says. "Orders are coming in." View the CETMA line of cargo bikes and racks at cetmacargo.com. 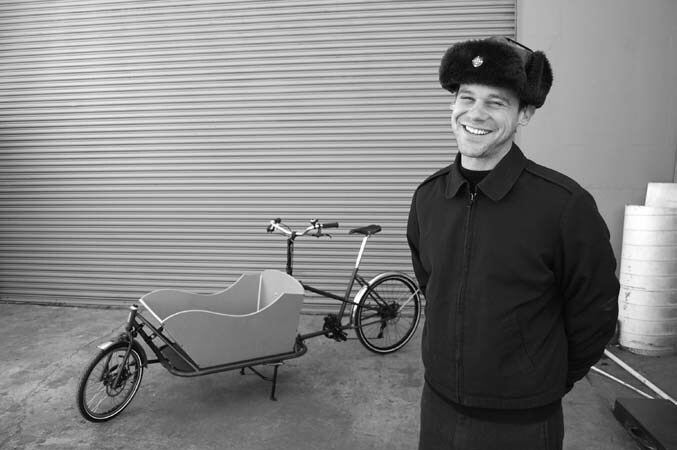 Check out Kagay's new one-man bicycle delivery service at greencourier.us.